If you like the 10th Doctor Who and are in need of a beanie hat then look no further. 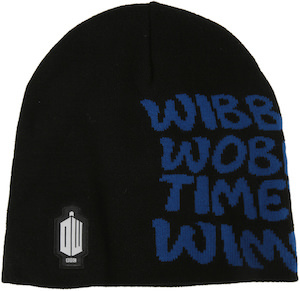 This Doctor Who beanie hat is black and has the Doctor Who logo on one side and the other side woven into the black fabric in blue letters it says “Wibbly Wobbly Timey Wimey” just like how the Doctor explained time and space. This Doctor Who hat is made from 100% acrylic and great for winter of course or any other day of the year you want to wear a beanie hat. Now any Doctor Who fan will want to own a beanie hat and that means that you should come and see this Doctor Who Wibbly Wobbly Timey Wimey Beanie Hat. Doctor Who fans need shoes to and with Toms being so popular they made a shoe that looks like that but more importantly it looks like the Tardis from Doctor Who. 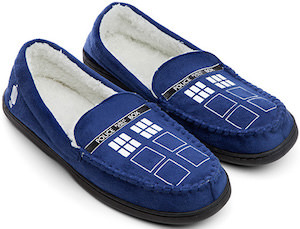 These canvas slip on shoes are Tardis blue and on the front you can see the windows of the Tardis complete with the top sign saying “Police Public Call Box” and then on the back there is a label saying “Bigger on the inside” something we all know to be true about the Tardis. These shoes even have a the Doctor Who logo on the footbed and on little labels on the side. If your are a Doctor Who fan in need of new footwear then you are in luck as you can get these Tardis shoes in a wide range of sizes. 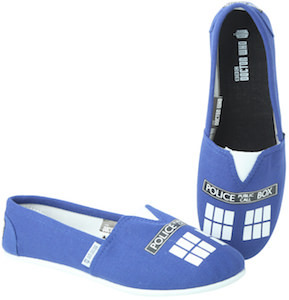 Do not wait any longer just come and check out these Doctor Who Tardis Shoes. 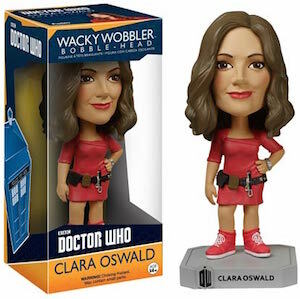 This black t-shirt show the 12th Doctor and his companion Clara. And below the picture of them it says “Am I a good man?” just like Doctor Who asked at the end of the second episode of series 9. This t-shirt is made is made for the introduction event of the 12th Doctor and this event let you see episode one and two in a cinema and that is why on the back of this t-shirt in white letters it says “Doctor Who Deep Breath Cinema Event August 2014”. And all that makes this a special t-shirt that comes in sizes Small – XLarge. 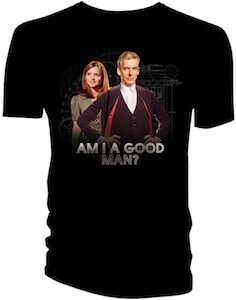 Show the world Doctor number 12 with this Doctor Who 12th Doctor And Clara Am I A Good Man T-Shirt. We seen leggings before at Shop Doctor Who but these ones look more fun to me. These leggings show the galaxy and the Tardis. As you can see above the Tardis is not just a tiny picture, it’s almost as high as a leg. Leggings like these are great to wear just like that with a nice shirt on top. Doctor Who leggings like these will be loved by almost any fan of the Doctor. And these form fittings Doctor Who Tardis leggings come in sizes Small – XLarge (more sizing info by clicking the picture). So if you don’t have the perfect pair of Doctor Who leggings yet then at least check out these Doctor Who Tardis Galaxy Leggings. To cold for bare legs? Great because then you can wear some fun Doctor Who leggings. Now there are those blue leggings that show a bit of a galaxy but just far in the background but on one leg you can see a picture of the Tardis and this picture wraps around almost completely around the leg so that people can see it on the front, back and the side. Just imagine how fun these leggings will look on you just like that or with a nice skirt or dress. And these Doctor Who Tardis leggings are available in a wide range of sizes to be a perfect fit. Come have a better look from all angels of these Doctor Who Tardis Leggings. Leggings come in all kind of prints but now you can get Doctor Who leggings with the Tardis on it and a big galaxy. These Doctor Who leggings have a print of the galaxy where the Doctor travels through and then on the bottom of one of the legs you can see the Tardis appear. And we all know that the Doctor is near if the Tardis appears. These fun Tardis leggings comes in a range of sizes from X-Small to X-Large. 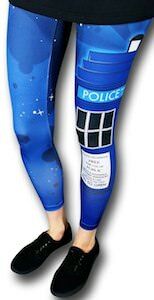 If you are a Doctor Who fan that likes to be stylish and warm then you should check out these Doctor Who Tardis Leggings. We all know that Dalek’s and Doctor Who are not friends but now you can get leggings that have the blueprints of the Dalek on them. Help the Doctor save the world by wearing these leggings. The leggings are nice and blue and shows all kind of drawings of the Dalek so that we can see how they where designed. Doctor Who fans who like warm legs and are in need of a pair of new leggings should check these out. The Doctor Who leggings will look amazing on any fan of the Doctor so if you are one then come and have a closer look at these Doctor Who Dalek Leggings. Looking for that perfect hoodie that reminds you of Doctor Who but not in a to obvious way so that everyone knows that never even seen the Doctor. This zip up Varsity style hoodie has a Tardis blue body with white sleeves and a white hood. And then there all kind of Doctor Who details. On one sleeve it says “63” as the first year the Doctor made it to TV and then on the front there is a big “DW” witch of course stands for Doctor Who. And then the most obvious part the waistband that is black and looks like the top sign of the Tardis and says “Police Public Call Box”. All that makes for a great hoodie for women that know what they want. And you can get this 100% cotton hoodie in junior sizes XSmall – 3XL. If you want to dream about the 11th Doctor then you should check out these Doctor Who pajama pants. These Doctor Who pants have squares in different colors and they are filled with items again in different colors and all the items are related to the 11th Doctor Matt Smith. You can see 3 items on these Doctor Who pajama pants, there is a fez, bow tie or the Doctor Who logo in the squares and that makes these pajama pants fun and colorful just like the Doctor. These Doctor Who pajama pants are made from 100% cotton and they come in men’s sizes Small – XLarge. Get ready to lounge around or sleep in these Doctor Who 11th Doctor Pajama Pants. You can never have enough Doctor Who pajamas and these pajama pants will be a great addition to you collections. These 100% cotton pants are black and have picture of the Doctor Who logo and the Tardis tumbling around but these are not just smooth images no these have a pixel design making them even more interesting. And these Tardis pajama pants comes in men’s sizes Small – XL but that should not stop the ladies from wearing them. Lounging around the house or just sleeping these pajama pants will be the perfect present for yourself or a friend that likes the Doctor as much as you do. Come and take a closer look at these Doctor Who Pixel Tardis And Logo Pajama Pants.